Happy Father’s Day to all the wonderful fathers in the world. Recent re search shows that dads greatly influence their child’s career choice*. My father was my first and still is one of my best mentors as I grow my own company. As an engineer and attorney, my father had a successful career from working in the underground mines in Butte, to Regional Trial Counsel, and finally Regional Administrator of the Securities and Exchange Commission for the Pacific Northwest region. Growing up, we always had all sorts of interesting people in our home for “business dinners” and traveled with him to fun locations for conferences. We were exposed to his work through lots interesting stories he excitedly shared with us over the dinner table. Equally important, he always did the dishes when he was home. That was his job. He still loads the dishwasher, and has added cooking and gardening to his list of jobs now that he is retired. Show up. He means be on time, be ready and if someone needs help, figure out how to provide it. He gave us confidence that we are smart enough to learn what we need to know, as we need to know it. These days it’s called “velocity of learning” or “just in time knowledge,” back then, you just said it like it was. He lives it to this day as an active volunteer. Family matters. My father traveled a lot as he was building his career as an attorney When he was home we got all his time and he helped with chores, schoolwork, etc. When he traveled, he took us with him when he could, and also arranged his trips around family events and birthdays. He is now a wonderful mentor to my grown sons and loves helping out his adult children. What do numbers four and five have to do with business? How you run your business should be no different than how you run your life. Bonus Tip: If you have a partner in business or life, make sure you value that relationship. 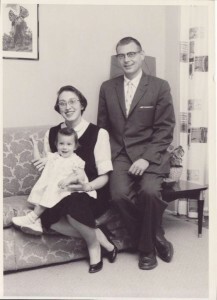 My father and my mother were equal life partners long before that was an expectation or norm. They dated for five years and have been married for 62 this summer. Their marriage has been a great role model for their children, grandchildren and community. My gift to my father is this blog, along with my gratitude and the recognition that he has shaped all of us kids into the grownups we pretend to be today. Thanks, Dad. …daughters whose fathers have been actively engaged throughout childhood in promoting their academic or athletic achievements and encouraging their self-reliance and assertiveness are more likely to graduate from college and to enter the higher paying, more demanding jobs traditionally held by males.